In microwaves, turntables are the mechanisms that make your food go around as part of the process of heating things up. They are spun by a motor mounted on the underside of the microwave. When the turntable motor goes out, the microwave continues to run, but your food may not be warmed through as evenly as it would have otherwise been. The most common symptom of a problem like this is the turntable not working. More specifically, the glass part stops rotating when the microwave is running. Once you have identified that the motor is what is causing the turntable to not work properly issue, the first thing you need to do is to order a replacement for the part that has stopped working. You may not be able to order through the manufacturer’s website, but there are several other websites you can order from. When you are ready to get started, make sure there is no power going into the unit by unplugging the microwave. This repair will involves some of the unit’s wiring, so turning off the power is not enough on its own. The microwave needs to be completely disconnected. Most are plugged in to outlets situated above the unit. Lastly, remember to remove the turntable from inside the microwave. The first step you need to take is to open up the underside panel. This will give you access to the bottom of the microwave and the turntable motor. To open up the panel, you will need to remove the mounting screws that hold it shut. Start from the sides and work your way towards the middle. Set the mounting screws in a safe place to the side of where you are working so you can locate them when you are ready to close the panel. When you are finished with this step, you should have full access to the turntable motor. Your second step will be to disconnect the wire connectors and detach them. The wire connectors have tiny tabs that hold them in place. They will need to be pressed down so that you can remove them from the motor. Use needle-nose pliers (or a similar type of tool) to make the process easier. The third step is to remove the old motor from the underside of the microwave. This can be done by unfastening the mounting screws that are holding the turntable motor in place. Once you have unfastened the screws, find a place nearby to set them down so you can easily find them again later – when it is time to fasten the new motor into place. Before setting the old motor to the side, remove the white spacer on top of it and temporarily set the spacer to the side. You will need the spacer for the new motor, too. After setting the old motor aside, get the new one ready by setting the white spacer from the old motor in the same spot on the new motor. Once the spacer is in the correct position, lift the motor up and put it into place on the underside of the microwave. Take the ring from the turntable stand and ensure it is seated properly on top of the motor. The two pieces are designed to fit together, so it should just be a matter of turning the ring in the right direction. The fifth step is to install the new motor. Once the new motor is in position, take the screws that were holding the old motor in place from the spot you set them down in and use them to secure it. This is done by tightening the screws with the screw driver. When the screws are sufficiently tightened, reconnect the wire connectors to the motor. It’s an AC motor, which means you can put the connectors back into place either way without any problems. A simple way to check that you’ve done the work correctly is do a quick run of the microwave with something inside. Fill a microwave-safe dish (like a mug or a bowl) with water – to give it some weight and test the motor. Once you have done that, place the dish on top of the turntable inside the unit. 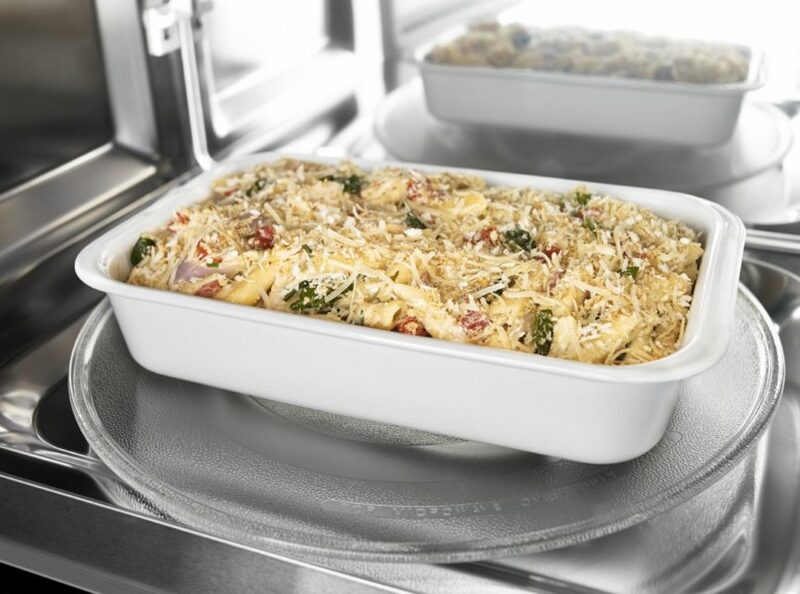 Set a short cook time, and watch to make sure it spins the dish around inside the microwave. If you find that the turntable is still not functioning after replacing the motor, there are two other things that may be causing issues. One of those is damage to the microwave’s glass tray drive coupling. The other is a broken or stripped out glass tray support. For more appliance troubleshooting tips and repair guides, visit the Dan Marc Appliances website. If you’re experiencing an issue with your appliances that are more complicated than you think you can handle, contact us to set an appliance repair appointment with one of our more than 60 certified repair technicians.